Recently, I have noticed the Skype for Business client prompting for credentials when it ties to connect to Exchange Web Services for mailboxes in Exchange Online (EXO). The EXO tenant is configured for Modern Authentication (ADAL) and Azure Multi-Factor Authentication (Azure MFA) but Skype for Business is still on-premises using kerberos. So, when the Skype for Business client tries to connect to EWS in EXO, EXO is attempting to ask for ADAL and MFA, but the client isn’t configured to respond with it. The solution is to create a registry value HKEY_CURRENT_USER\Software\Policies\Microsoft\Office\16.0\LyncAllowAdalForNonLyncIndependentOfLync to enable the Skype for Business client to respond accordingly. Details can be found at https://support.microsoft.com/en-in/help/3082803/info-about-the-allowadalfornonlyncindependentoflync-setting-in-skype-for-business,-lync-2013,-and-exchange-online. Change to Office365/Exchange Online PowerShell URL? Are you trying to connect to Exchange Online and only seeing this error? WinRM cannot complete the operation. Well, Microsoft is reporting an outage right now and after a colleague opening a case, he was informed that the URL that is in all documentation for PowerShell connections to Exchange Online has changed slightly. Microsoft has introduced the all new Hybrid Migration Troubleshooter, which was first introduced during Microsoft Ignite in Chicago. Why did they create this troubleshooter? The Hybrid style of Mailbox move is one of the most popular and complex types of migration strategies. This option gives you a way to move some of their mailboxes to Exchange Online, while keeping some on-premises. It is also the only option that allows for your mailboxes to be off boarded using the native toolset. It is because of that complexity that Microsoft have seen many customers confused when trying to determine why there migration is failing, appears slow, or stalled. Microsoft Ignite session catalog has been posted! This morning, Microsoft announced the availability of the session catalog for Ignite, Microsoft’s new, premier enterprise technology event. This provides the first in-depth look at the hundreds of sessions that will be available across Office 365, SharePoint, Exchange, Lync and also watch as GM Julia White breaks down why you should be at Ignite this May. On February 3rd at 9:00 a.m. PT, they’ll have the whole event team and lots of speakers ready to chat with you on Twitter. They’ll be ready to answer your questions about the event and hear what you’re excited about in terms of community experiences and things to do in Chicago. Add the event to your calendar with this link. A hotfix KB2966827 had already been installed that causes this issue. I determined if KB2966826, KB2966827, or KB2966828 were installed, and uninstalled them until after .NET 3.5.1 was installed. (http://www.askvg.com/fix-0x800f0906-and-0x800f081f-error-messages-while-installing-net-framework-3-5-in-windows-8/) After installing .Net 3.5.1, you can safely re-install the hotfixes. 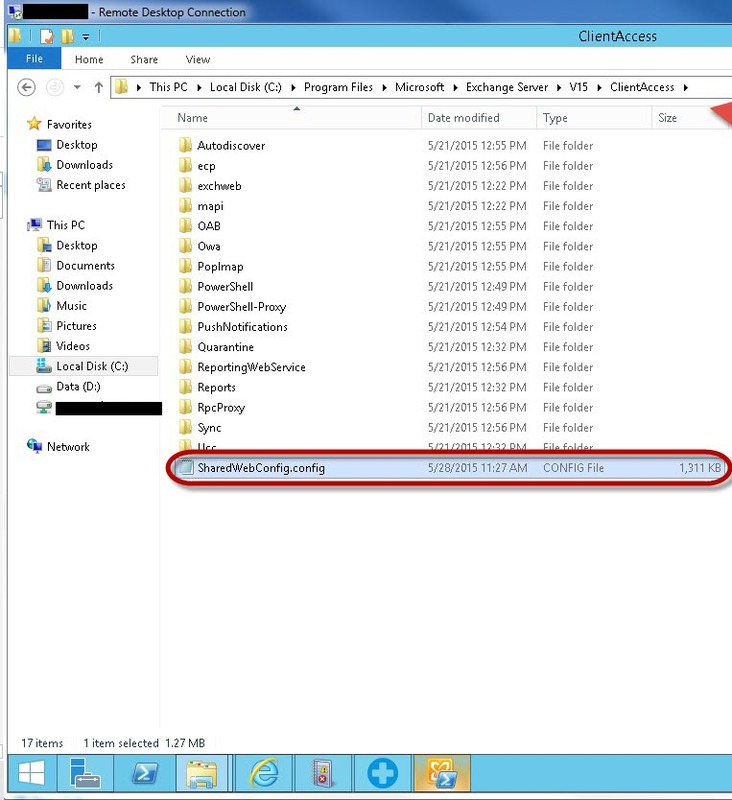 Exchange 2013 – Outlook Online Mode – Search Folders Break! I ran into a new issue that I wasn’t aware of until now. 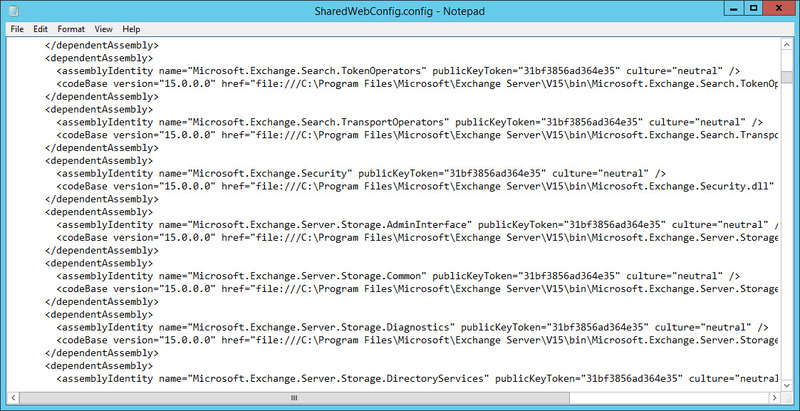 When Exchange 2013 was RTM’ed, it was known that OWA no longer supported Search Folders. Those are the folders you can create in Outlook that show a specific filtered view of your mailbox. Those can contain items like UnRead Items, Missed Conversations, Call Logs, Flagged Email, Categorized Email, etc… I personally don’t use Search Folders, but I know that many people do. I also know a few organizations that have standardized their desktop infrastructure using one brand or another of VDI. Within their VDI solution, they have chosen to deploy Outlook 2010 or 2013 in Online mode and their internal Exchange 2013 servers have been scaled to support Online Mode. This lays the groundwork for the problem. Outlook cached mode, along with many other features, is this mode that maintains the finder info on the local PC. Since the finder information is no longer synchronized to the Exchange 2013 server store, the server doesn’t store finder information any longer (which indecently is one of the reasons why Search Folders are no longer offered in OWA). In Online Mode, the users still can try to use Search Folders, and they appear to work until they try to interact with the messages shown in the Search Folder. Actions like Delete will produce an error message that tells the user (depending on Outlook version) that either the message can’t be found, or better yet, “Unknown Error”. The solution is to enable Cache Mode, full stop. I have not yet confirmed this with the Exchange Product Team but it is my belief that since Office 365 utilizes Cache Mode exclusively and since cache mode is now supported in VDI deployments, that this is by design.